This post may be late but the photos were taken around the middle of the month. This August, our fourth on the island, has been a record breaker. The intense high summer heat has been higher than usual and more troubling has lasted much longer than it normally does. Cypriot tradition states that the weather starts to ease after the big holiday on August 15, the Assumption of the Virgin. This year that simply hasn’t happened. Now, in the last days of August, the temperatures are as high as they were as the start of the month. The forecast suggests that by the middle of next week we might see a drop of one or two degrees. Meanwhile the Government continues to issue severe weather warnings and the Fire and Forestry departments battle to deal with local wildfires, many of them believed to have been started deliberately. The blog is still receiving a fair number of visitors who are searching for information about Cyprus heatwaves. 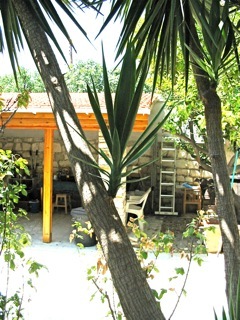 The garden has gone into a strange summer hibernation; apart from the citrus and the bougainvillea nothing is growing. Regular watering is preventing things dying but the plants seem to have slipped into a stasis mode. Once the temperatures drops they should start showing signs of life once more but for now they are in a deep sleep, and not looking particularly photogenic as a result. The citrus trees are taking things in their stride though; tiny green fruit are slowly growing and swelling. 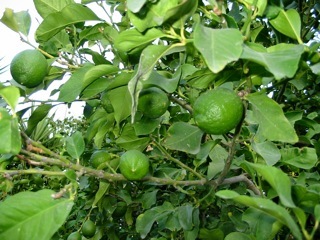 The new season lemons are some way off being ripe and for now the only yellow lemons in the supermarkets are imported. It is the time of the lemon drought in Cyprus. Happily we’ve still got supplies of both frozen juice and sliced lemons to see us through. The mandarin tree is still giving some cause for concern. Last year we had hundreds of fruit, this year we feared that we had none. Blossom was very sparse and no blossom means no fruit. We’ve now spotted a few clusters of tiny mandarins, and they look to be progressing well, but it is a very poor crop compared to last year. 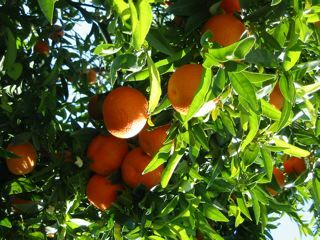 It looks like we might get 30 or 40 mandarins as opposed to the thousand or so we had last year. Clearly we missed a vital part of the annual maintenance but what? Our old friend, the yucca plant, produced another set of offsets before the temperature got too high. We missed the chance to remove them when they were very small so a hacksaw may be needed to separate them from the main tree now. They are incredibly resilient; remove them from the tree and put them straight into a pot and they will start to grow. They will even cope with being put straight into the ground with no other care. They will grow in the poorest soil with no additional feeding and only minimal watering. In Aradippou a friend gifted us half a dozen offsets; within two years they’d grown to over four feet tall and were producing offsets of their own. To be honest, anyone with a yucca here is always looking for someone with a new garden who needs fast growing plants. And finally while the bougainvillea continues to grow it is also starting to drop its coloured bracts. And a plant as large as ours has an awful lot of them. 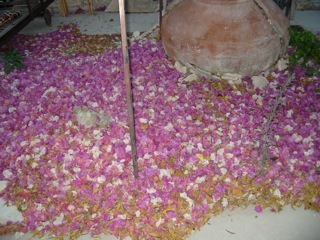 This carpet below would fill five or six dustbins … if only the heat would ease so that we had the energy to shovel them up. The sun is shining, jobs are done for the day so before we put the kettle on for a well earned cup of tea we thought it would be useful to get some photos of the fruit trees in the garden and surroundings. The fruit is ripening day by day so it’s a good time to capture where each of the trees is in their cycle. 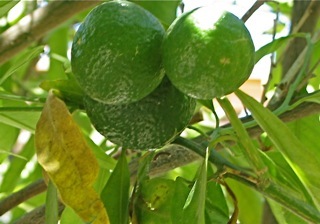 The small citrus tree is absolutely laden with fruit … they are tiny, but there are plenty of them. Mandarins ... tangerines ... satsumas ... clementines? So far we aren’t entirely sure what they are … mandarins, clementines, satsumas, tangerines? Mad Alex allowed someone to strip all the fruit from the tree before we took possession last year. For some time this wasn’t clear, leaving us thinking the tree produced no fruit at all, until we spotted two stray fruit lurking right in the very centre. Clearly too hard to harvest for whoever took the rest of the fruit! We picked the remaining two and they were lovely … not too sweet or too tart and not oversupplied with pips either. So far it looks like we’ll get a good crop but at the moment over 95% of the fruit are still a dark green. The occasional one or two are starting to turn to a pale green, then yellow before becoming bright orange in late November. The two lemon trees are also doing well. The tree near the gate has larger, still solid green, lemons; the garage tree has smaller but more advanced lemons which are just starting to turn yellow. The pomegranate tree is presenting some problems with regard to its attractiveness to local wildlife, but that’s an issue for another day. In the meantime the fruit that have escaped such attention are ripening fantastically well. One of our neighbours has three trees in her courtyard. Last year she estimated that they produced over 100 kg of fruit between them. Far, far more that she could use or give away to friends, so she ended up bagging up the fruit and leaving them outside her house with a note offering them for free to tourists. Just around the corner, down the donkey track, there is a derelict plot containing the remains of a partially renovated two storey house. If anyone is looking for an adventurous renovation project then look no further! In the absence of any care and maintenance pomegranate and particularly fig trees have been growing unchecked. The figs are coming on well, with a mix of under-ripe and hard green fruit and delicious looking ripe purple figs. Those with a keen eye may notice an interloper in the second of the fig photos. The photographer gets no points for observation today having missed the tiny praying mantis posing on a branch just off to the left of the figs. All being well, updates to come in due course!